Thanks to Grand Avenue Jewelry for sponsoring this post. I'm always looking for an excuse to get dressed up. If I had my way, every weekend in December would be booked with a party or gathering, any reason for a pretty dress, a pair of heels, and fabulous jewelry. 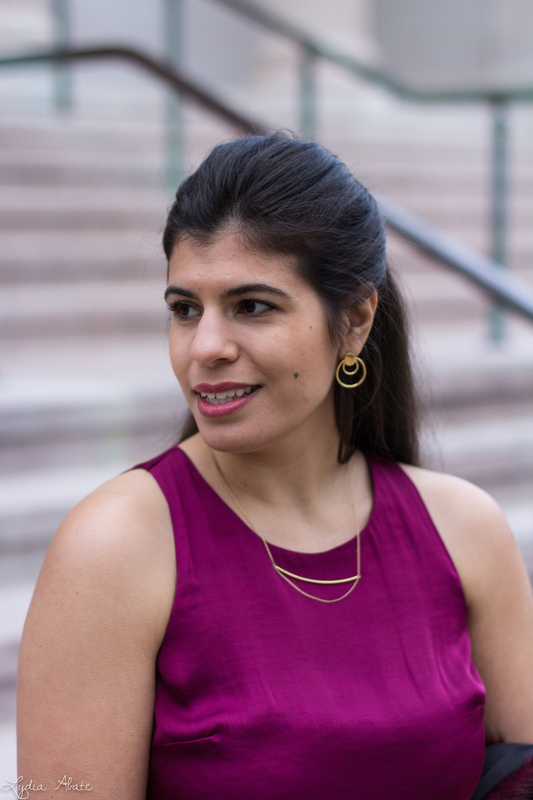 When Grand Avenue Jewelry asked me if I'd be interested in styling a couple pieces from their latest collection, it was an immediate yes; gold and minimalistic has very much been my style as of late. The pieces crafted from brass and double plated in 14 karat gold feel special enough for an evening out, but are also completely wearable for everyday. While I can sometimes be wary of plated jewelry, Grand Avenue describes their double electroplating process as being four times thicker than average, yet they keep their markups low enough that all the price points are under $100. Better quality jewelry that is kinder to my wallet certainly meets my approval! If you are still searching for gifts for some of the special ladies in your life, or just something to treat yourself, Grand Avenue Jewelry is offering Chic on the Cheap readers an exclusive discount code, which can be used through the end of the year. Use CHICONTHECHEAP20 to get 20% off your order! You look stunning and so festive, love this color on you. The gold jewelry compliments it perfectly. I came RACING over to this post when I saw it on Instagram! This color, omg THIS IS AMAZING!!!!!!!!!!!!!!!!!!!! I would totally say this is your power color! This outfit is so glamorous!! 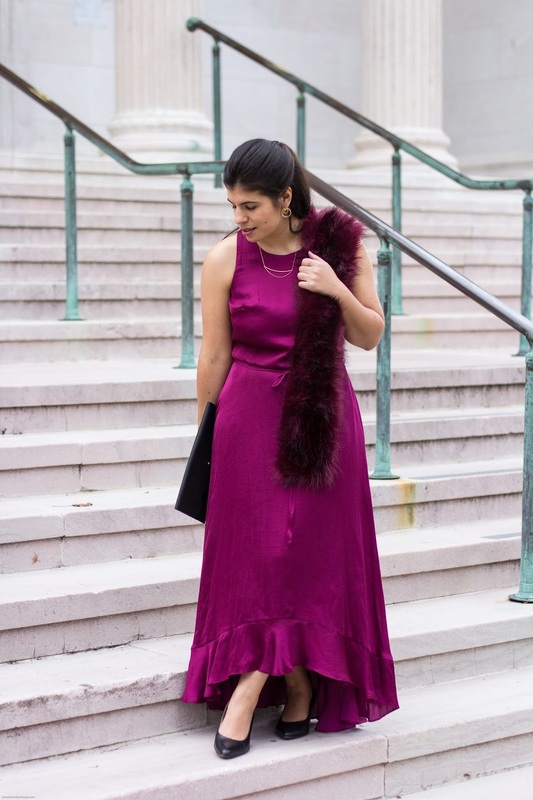 Seriously love the monochromatic burgundy and the stole was the perfect addition. And the jewelry pieces are beautiful! They make a statement yet minimal, which is how I like my jewelry! These pieces are so dainty and feminine, I love them! This whole look is stunning! I love the color of your dress, you are really channeling your inner starlet! You look amazing! and the jewelry is awesome! Now that's a fabulous necklace that really enhances the dress instead of detracting from it!! I love the gold pieces! 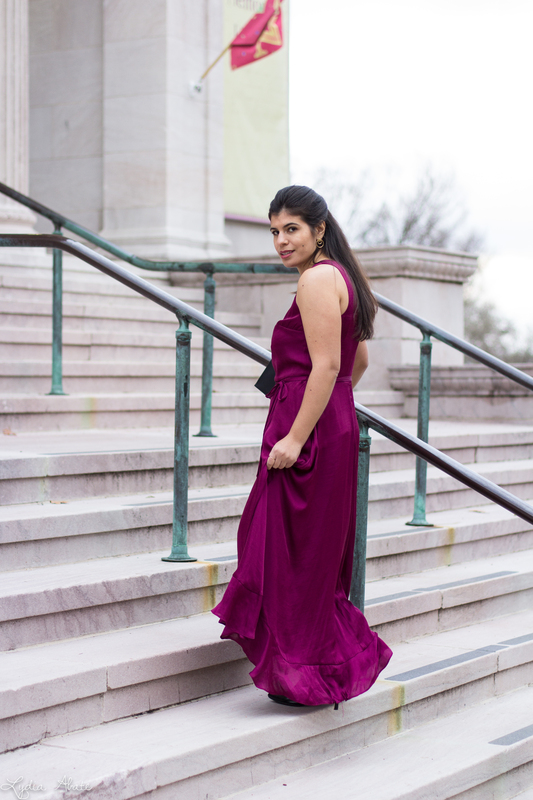 They're so simple yet elegant, and work perfectly with this dress! I agree with you -- I'd love to be dressed up at a fancy party every weekend this month. I love your hair back like this, and that necklace is divine. But because I have one similar, I really can't take my eyes off your Target faux fur scarf -- so chic. you look so stunning and festive! great post! 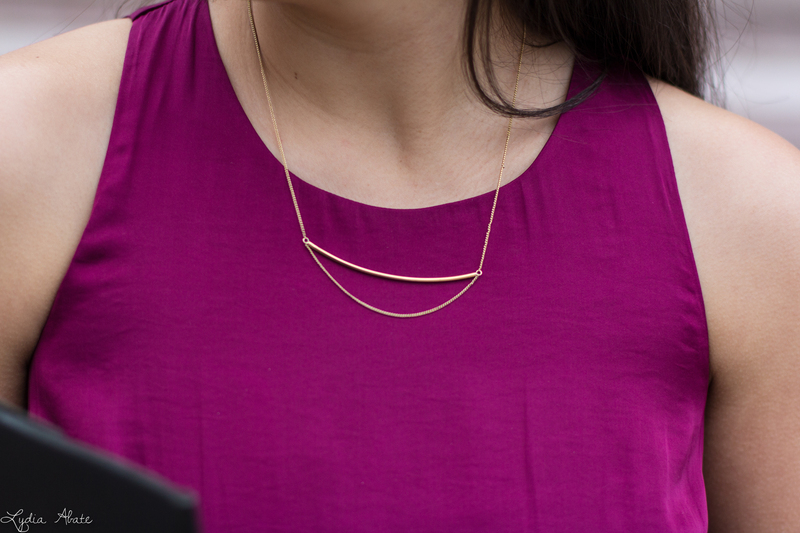 Pretty and simple jewelry is the perfect accessory for that statement purple dress! You look absolutely amazing! You look beautiful.. lovely jewelry. You look so stunning and chic! That fur stole is gorg! Omg you look sooo stunning! I love that color dress and your jewels! I'd heard about this brand here and there and wondered about the quality and styles. I love the dainty pieces you picked out and yet how they made a statement even against your glamorous ensemble. So beautiful! I absolutely love your necklace! So gorgeous and the color of your dress is amazing! Oh wow you look amazing Lyddie! The color is gorgeous on you and the fur is so glamorous. I love the necklace you are wearing! Beautiful jewelry pieces. I love the circle earrings! I love these jewelry pieces; they are so beautiful! & this dress is absolutely gorgeous on you, I love the color! What a stunning gown! The simple gold accessories are so perfect with it too! :) I like the colour combo, and the designs work so well with the dress too. I'm more of a homebody and introvert so while I admire the pretty party outfits on others, I prefer filling my Christmas calendar up with things at home or not too far from home, haha! This is a stunning dress!!! Love it! 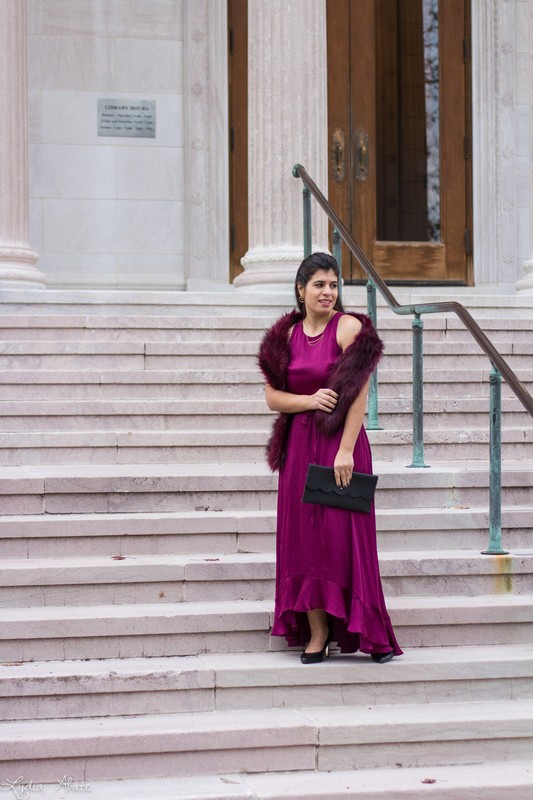 LOVE LOVE THAT STUNNING DRESS AND TONE-ON-TONE LOOK YOU CREATED WITH IT USING THE BEAUTIFUL FAUX FUR SHAWL. And indeed those dainty jewelry pieces are beautiful. Like you, I wish every weekend would have an occasion for me to dress up! LOL You look beautiful, Lydia. Wow!! That dress is absolutely stunning on you! I love the fur wrap too! They are perfect together. I am wary of gold plated jewelry too because it seems to wear off so quickly. It's nice that this brand has a thicker coating! What an elegant outfit Lydia! 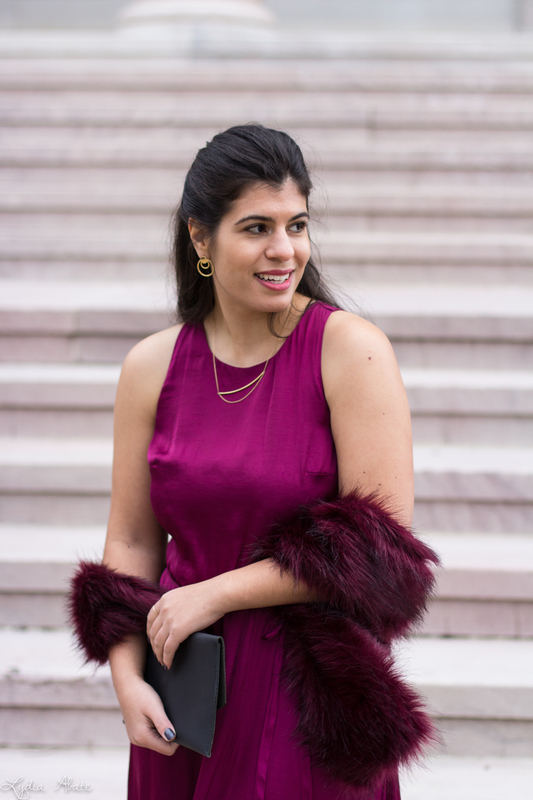 The jewel tone dress and gold necklace are a wonderful combination and so wearable to allll the holiday events! So lovely dear, simplistic, minimalist, but super elegant. I just got back home to find YET another wedding invitation.... this one's themed "tropical chic" or something like that. Your dress sans the fur would look marvelous for this. If you were only my neighbor.